I have found it absolutely hilarious and, often times, I think it’s a joke when people have been telling my how great my skin looks lately. I have dealt with acne and hyperpigmentation for all of my adult and adolescent life. Literally, since puberty came along and ransacked by body, I’ve struggled with my skin. So, when people tell me that my skin looks good, I look around in astonishment, “Girl, where? Who’s skin looks good?! “. Ok, so for the first step in the double cleansing process, I’ve been using Derma E’s Nourishing Rose Cleansing Oil and the Rejuvenating Sage & Lavender Face oil. I layer these oils on my face and neck and then hop in the shower. I’m not sure if the steam from the shower has any real effect on the oil penetration but I do it anyway! For the second step in the double cleanse, I’ve been using and obsessing over the Sulfate Free Facial Cleanser from Bolden. Y’all, this thang is all the way official. It gets the skin really clean without stripping away all of the natural oils. I’ve used some cleansers in the past that got my skin a little too clean and ended up causing it to over produce oil and create acne. Raise your hand if you want your cleanser to create more skin issues for you? Not me, girl! Tula* has not one but TWO bomb products for exfoliating the skin. In previous lists, I’ve mentioned the Exfoliating Treatment Mask. However, this year, they’ve introduced the Dual Phase Skin Revival Treatment Pads and they’re, dare I say it, BETTER! I alternate between the two just to feel fancy. I use the mask when I want to transport myself to a spa in the comforts of my NY apartment. The clay mask really does a good job of removing impurities and leaving the skin feeling fresh and renewed. So, the mask is really good, right?! But these treatment pads are the TRUTH. It’s literally a pad that you slip onto on your fingers. You use the white side to deposit the godsend of an exfoliant serum onto your face and then you flip it to use the blue side to go to werk on your face and neck. Let me explain something to you; this pad leaves nothing behind. Your face will be SMOOTH smooth and clear. Note: Only exfoliate 2 – 3 times per week. *You can get your hands on all of the Tula Products that I will mention in this post (and any other products that I don’t mention on Tula.com) for 20% off if you use my code: WERK20 at checkout! The code is not valid on sale or auto-delivery items. Ok, so I’ll be honest, I just started using a toner this year because I didn’t know any better. This Rose Deep Hydration Facial Toner from Fresh is exactly what it says, hydrating. More than that, the toner really preps your skin to receive all of the benefits of the subsequent steps in this routine. 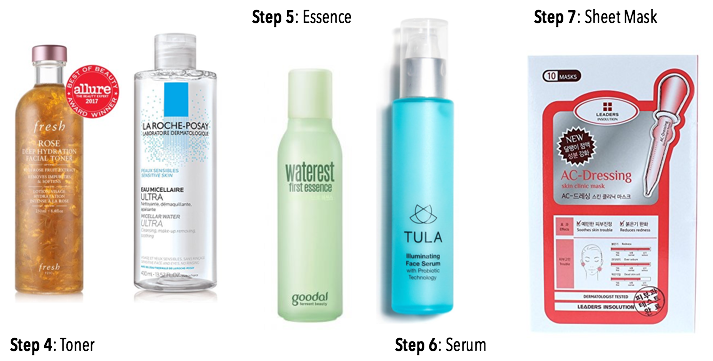 After wearing a full face of make-up for a majority of the day, I will add the LaRoche-Posay Effaclar Micellar Water into the mix right before the toner to make sure that all of the make-up is gone. It’s my litmus test to see how well the cleansing steps worked. Now, an Essence was COMPLETELY new to me. This is apparently the crux of the entire 10-Step Korean Skincare Routine . So, I’ve been using samples until I feel like making an investment. So, far I’ve been using the Waterest First Essence from Goodal and so far so good! I think this step is the quiet storm for the entire system. My pores are smaller, my skin is smoother, more hydrated and my hyperpigmentation is fading! I, also, have a sample of Real Ferment Micro Essence from Neogen that I’m pretty excited to start using. SK-II Facial Treatment Essence is supposed to be the real OG in this category. I’m working my way up to this level of skincare status and luxury! Next up, is the serum step. So, you can basically use any products that are going to address your specific skin conditions. For me, I’m always looking to address my hyperpigmenation and acne. The Illuminating Serum from Tula* is a real winner and it doesn’t irritate my skin. It’s claim to fame is helping with dark spots, hyperpigmentation and dull skin! I, also, just started using the Triple C Lightening Liquid from CosRx which has amazing reviews and ALWAYS sells out. Now, I feel like this may be my favorite step in this whole process. I’m really in relaxation mode when it’s sheet mask time! There are so many affordable sheet masks with differing benefits. So, you can address all of your skincare concerns! I only use a mask once or twice a week usually on Sunday and Wednesdays. I leave it on for no less than 30 minutes to seal in all of the previous steps. I’ve tried a few and have really enjoyed the price point and quality of the masks from Leaders and MediHeal. They seem to fit my face and adhere better. Once the essence from the mask has settled nicely into my skin after 30 minutes; I remove the mask, tap the rest of the product into my face and let it dry. No rinsing required! Ok, I’ll be honest the eye cream that I’m currently using is just ok. I can’t tell if it’s actually doing anything. Well, why am I using it then? Because I have it and I’m not in the season or status to be wasting things. So, there. However, once I’m done, I’m definitely down to try the Revitalizing Eye Cream from Tula*, of course. Ok, we’re wrapping this thing up! In the morning, for the moisturizer (which I call the finishing step), I’ve been using the Rose Deep Hydration Face Cream from Fresh in the morning and the Multi-Spectrum Overnight Skin Rescue Treatment from Tula at night. Y’all, the Overnight Treatment from Tula is skin CRACK. It’s something about the probiotic technology used in these Tula products, they just overall make my skin look cool, calm and collected. The Fresh moisturizer is great for daywear because it doesn’t leave a heavy residue. You will glow not look greasy under your makeup. That’s a real win if you ask me. I will be the first to admit that I need to get 100% better about wearing SPF EVERY day and not just when I’m going to lay by the pool. So, I’ve been using the Super Power Sunscreen Mousse SPF 50 from Super Goop. It has a nice finish that can be worn under make-up. I’m still working on being more consistent with this step. Ok, I added this step to the process, although over time you may not need it. These steps are working miracles on my skin! In the meantime, I’ve found and become obsessed with the Natural Finish Pressed Foundation SPF 20 from Colorescience. It’s just a good basic foundation. It doesn’t make me greasy, it doesn’t get all over my clothes like some liquid foundations that I’ve tried in the past. It’s just goodt and it has SPF! So, these are all of the products that have been slaying my skin lately. Of course, I have things in queue to try over the next couple of months and I’ll keep you all posted on the results. Feel free to leave any questions, recommendations or reviews below. *Note: If you do actually decide to purchase products from this list, please use the product links provided in the text and the clickable image slidebar above. They link directly to the product and I, also, get a commission from the sale. We both win! Thank you for posting! Read this on my phone phone last night while nursing my little one. Going to try some of these. No problem! I’ve been going to Dermatologists for YEARS and this routine has my skin looking the best it has ever looked. I hope that you find the same success while using it! I am glad for writing to make you be aware of of the exceptional discovery my wife’s child had visiting your site. She figured out several things, most notably what it’s like to have a great helping spirit to get many more with ease have an understanding of specific very confusing issues. You truly exceeded readers’ expectations. Thanks for displaying such good, healthy, edifying and even unique tips on this topic to Lizeth. A lot of thanks for your whole hard work on this web page. My mum take interest in engaging in research and it is obvious why. A number of us notice all regarding the compelling tactic you make helpful strategies through this web blog and improve response from the others about this issue so our own child is undoubtedly discovering a whole lot. Take advantage of the remaining portion of the new year. You are performing a useful job. Thank you a lot for giving everyone a very nice chance to read from this blog. It is always very pleasant and stuffed with a lot of fun for me and my office friends to visit your website minimum three times a week to study the latest items you will have. Not to mention, I am just actually contented with your fantastic points served by you. Selected 2 facts in this posting are honestly the best I’ve had. I have to express my appreciation to the writer for bailing me out of this circumstance. As a result of surfing around through the online world and coming across notions that were not beneficial, I was thinking my life was well over. Existing without the solutions to the problems you have fixed by way of your main guide is a crucial case, as well as ones that could have badly affected my career if I had not noticed your website. The understanding and kindness in taking care of the whole lot was invaluable. I’m not sure what I would’ve done if I hadn’t encountered such a thing like this. I’m able to at this time relish my future. Thanks a lot so much for this expert and result oriented guide. I will not think twice to refer your web site to anybody who would like guidelines on this issue. I am writing to let you be aware of what a magnificent experience my daughter obtained studying the blog. She discovered plenty of details, which include what it is like to have an ideal giving spirit to have the rest without problems thoroughly grasp a number of very confusing topics. You truly surpassed readers’ desires. Many thanks for displaying these effective, safe, revealing and also easy guidance on the topic to Mary.